Bushpigs beat Batemans Bay Boars 28-12 on the weekend. 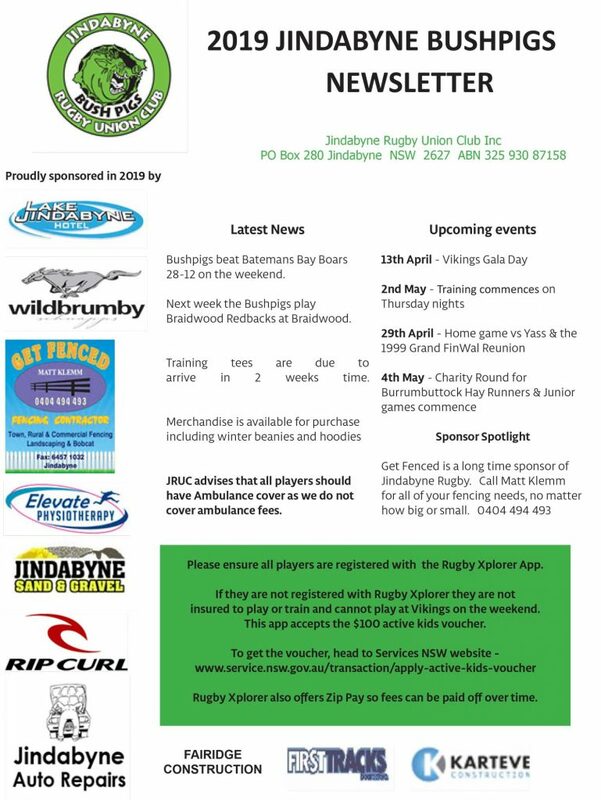 Next week the Bushpigs play Braidwood Redbacks at Braidwood. Training tees are due to arrive in 2 weeks time. JRUC advises that all players should have Ambulance cover as we do not cover ambulance fees. Please ensure all players are registered with the Rugby Xplorer App. If they are not registered with Rugby Xplorer they are not insured to play or train and cannot play at Vikings on the weekend. This app accepts the $100 active kids voucher. To get the voucher, head to Services NSW website – www.service.nsw.gov.au/transaction/apply-active-kids-voucher Rugby Xplorer also offers Zip Pay so fees can be paid off over time.